From Goodreads ~ In the South, a conversation among home cooks can be just about as illuminating as any culinary education. Luckily for Stacey Little, home cooks run in the family. Whether it's fried chicken or pimento cheese, fruit salad or meatloaf, everybody's family does it a little differently. 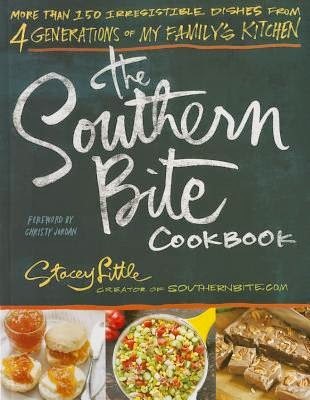 "The Southern Bite" is a celebration of those traditions and recipes every Southern family is proud to own. It's the Pecan Chicken Salad that's mandatory for every family reunion and the hearty Goulash, so comforting after a long day. It's the Glazed Ham that makes its way to the Easter table every year. If you're lucky enough to hail from the South, you'll no doubt find some familiar favorites from your own family recipe archives, along with a whole slew of surprises from Southern families a lot like yours! There's Turnip Green Dip for your next party, Chicken Corn Chowder for those chilly fall nights, and Cornbread Salad for when you really need to make an impression. No matter what's cooking, Little's goal is the same: to revel in the culinary tradition all Southerners share. These are the recipes that bring us together and the meals our families will cherish for generations to come. 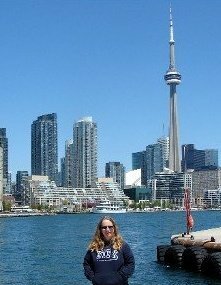 Being from Canada, the only thing I know about Southern cooking is what I read in books. So when I was offered a copy of this book to check out, of course I said "yes" so I could see what exactly is Southern cooking. The book starts off with an introduction of the author's background and how he started the blog, Southern Bites, about five years ago sharing his restaurant reviews and musings, eventually posting recipes. This is followed by some kitchen tips like what is bacon grease and how to store it, how to make your own light brown sugar, etc. Party Bites - Pizza Pull-Apart Bread, Dill Pickle Dip, Just Plain Punch, etc. Weeknight Bites - Easy Smothered Chicken, Porcupine Balls, Chicken Pot Pie, etc. Weekend Bites - Almost Famous Fried Chicken, Chicken Bog, Brunswick Stew, etc. Side Bites - Gumbo Greens, Hot Tomato and Bacon Pasta, Buttermilk Mashed Potatoes, etc. Potluck Bites - Poppy Seed Chicken Casserole, Slow Cooker Chicken and Dumplings, Chicken Spaghetti, etc. Holiday Bites - Cranberry Relish, Coconut Cake, Martha Washington Balls, etc. Heirloom Bites - Old-Fashioned Biscuits, Southern Chocolate Gravy, Nana Hoops' Mac and Cheese, etc. Sweet Bites - Gamma's Chocolate Pie, Papa's Lemon Icebox Pie, Sweet and Salty Toffee Bar Cookies, etc. With each recipe, there are the author's thoughts about the recipe and stories in the chapters which makes it more personal. There are lots of colour pictures throughout the book of the dishes. I'm looking forward to trying some of the recipes in this book and I'll share the recipes when I do. 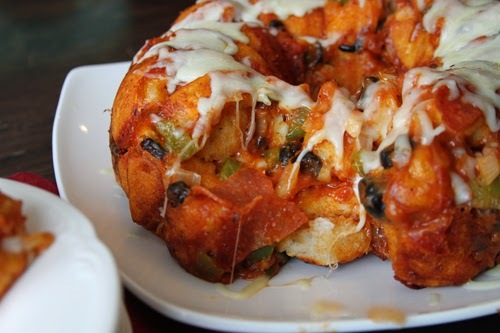 For example, the Pizza Pull-Apart Bread looks yummy and sounds easy to make! Open biscuits and cut each biscuit into quarters. Place in a large bowl. Add pizza sauce to bowl and Stir gently to coat. Add diced pepper and onion, Parmesan, olives, pepperoni, and 1 cup mozzarella cheese. Stir gently to combine. Pour mixture into a greased Bundt or tube pan and bake at 350 degrees F for 45 to 50 minutes or until golden brown and biscuits are done throughout. Remove from oven and invert onto a platter while hot. Top with remaining cup of mozzarella.